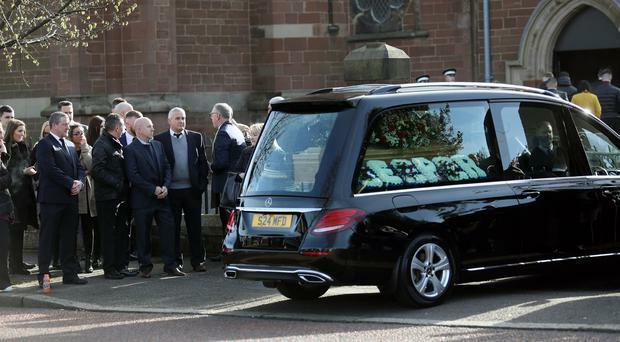 The hearse carrying the coffin of Reece Leeman arrives at St Mark's Church for the funeral in east Belfast. The funeral of murdered east Belfast man Reece Leeman was told his violent death should not be allowed to overshadow the many precious memories his family and friends hold of him. His parents, while left devastated after the young man's death were said to be comforted by the many messages of support they have received over the past week. Reece was found collapsed in Connsbrook Drive in the early hours of last Friday morning, March 15. He had been stabbed. On Saturday around 600 people packed out St Mark's Church for the service with many more outside. The Blues & Royals flute band, of which Reece was a member, formed a guard of honour as the 21-year-old was carried into the church. Sister Melissa gave a "beautiful loving and humorous tribute," highlighting some of her memories of growing up with Reece, describing him as a special brother and son to his parents Gail and Matt. "He was a kind and loyal and considerate young man who had soft spot for animals of all kinds," Rev Helene Steed told mourners. "There is hole left here after Reece's precious life, it is a hole we must learn to life with and Christ will help us to live with that." She continued: "In Reece's family home now there is an empty chair. Let us remember Reece who in his earthly life sat in that chair. Let us remember him for his personality, his qualities and not just his violent death." She said the death should not "be allowed to take away our many precious memories of him, nor take away our lives and souls". Reece was a former pupil of Belmont Primary School, Strandtown and Ashfield Boys. He loved football, following Liverpool, Rangers, Northern Ireland and local side Harland & Wolff Welders. During the funeral service pictures of him were played on a loop on a screen. Rev Steed told the Belfast Telegraph parents Gail and Matt were "completely shattered" by the death but had found great comfort by the many people who had written to them and supported them in various ways over the past week. "It is a loving family," Rev Steed continued, "they were very close and family was very important to Reece." Mr Leeman was found collapsed on Connsbrook Drive after being seriously assaulted on Friday, March 15. Police believe Mr Leeman was stabbed after an altercation at a property on Kyle Street. One man has appeared in court charged with his murder.